Board Chairman Nelson Carbonell said he is convening a task force focused on volunteer and alumni engagement to explore ways to keep former students involved with the University and keep donations flowing. Updated: Sept. 5, 2017 at 1:35 p.m.
Two months after the largest fundraising campaign in University history officially wrapped up, the Board of Trustees is launching a year-long effort to figure out what comes next. 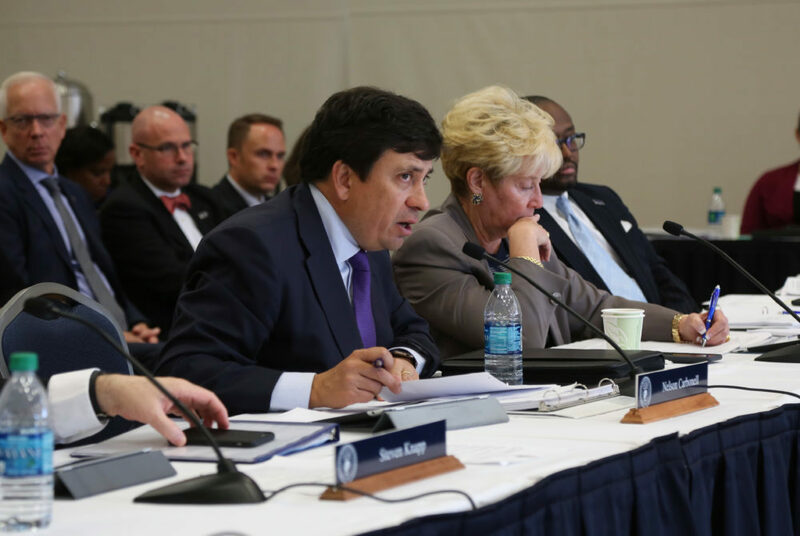 Board Chairman Nelson Carbonell said he is convening a task force – which will meet for the first time this month – focused on volunteer and alumni engagement to explore how to keep former students involved with the University and keep donations flowing. Fundraising experts said the task force would be a way to assess the University’s fundraising strategy – a step many institutions take after a major push like the $1 billion campaign. Carbonell said the Board decided to start the task force after University President Thomas LeBlanc came to the Board of Trustees retreat in June – just after the completion of the record-breaking $1 billion campaign – to discuss his priorities for his first year in office. “Since we finished the campaign in June there’s a ‘now what’ question and so we’re using that to figure out how do we continue to engage with people, what’s the next step in terms of our fundraising and things like that,” Carbonell said in an interview last month. Carbonell said the task force will have between 12 and 15 members, including six trustees, two students and some alumni. He expects the group will meet for at least the duration of this academic year and for no more than two years, he said. Members will examine the University’s fundraising strategy but also delve into ways to increase the connection between GW and its former students, he said. Roslyn Brock, a trustee, alumna of the Milken Institute of Public Health and former chairman of the NAACP’s national board of directors, will chair the task force. Carbonell said the task force will not wait until it stops meeting to make recommendations but will instead make suggestions over the course of the year. Matt Manfra, the interim vice president for development and alumni relations, said he welcomed the committee’s creation because University volunteers play important roles in the community by promoting GW’s brand and mentoring current students. “The creation of the Board of Trustees’ Volunteer Engagement task force helps further catalyze and advance efforts to expand volunteer opportunities and to provide a consistent, comprehensive experience,” he said in an email. Alumni made up more than two-thirds of the donations to the $1 billion campaign, but in past years, officials have sought to raise the alumni giving rate, and organizations like the Alumni Association have been focused on making former students more involved in the University’s goals. Last fall, the alumni giving rate was roughly 9 percent, relatively unchanged from previous years. The task force is one of two that the Board plans to convene this academic year. The other will focus on how to address issues with the student experience raised during the presidential search last year, Carbonell said. Both will include two student voting members – part of the Board’s plan to increase student representation. SA president Peak Sen Chua said the SA had to quickly find students to fill the spots on the task force. He and SA Executive Vice President Sydney Nelson tried to appoint the most diverse candidates from different backgrounds, he said. “We pulled primarily from students that we thought had important perspectives to bring, important communities that they were a part of,” Chua said. Matilda Bress, the SA’s vice president for undergraduate student policy, and SA Sen. Aika Aluc, MISPH-G, were chosen to sit on the task force. Bress said she wants the task force to examine ways to improve campus life for current students and encourage more involvement with the University down the road. Brian Gawor, the vice president of research at Ruffalo Noel Levitz, a fundraising consulting firm, said the task force would help the University engage alumni who donated for the first time as part of the $1 billion campaign and keep them invested in the progress on campus. He said the majority of young alumni are interested in volunteering efforts, like recruiting prospective students, which often attracts donations by bringing alumni back to campus and reminding potential donors of the importance of the University. “It can really be quite incredible for an institution, some of the best institutions in the nation have long established alumni volunteer programs,” Gawor said. Michael Worth, a professor of nonprofit management, said volunteering in university programs to recruit and mentor students is a major way universities build connections with former students and keep them interested until the next campaign. The Hatchet incorrectly spelled Roslyn Brock’s last name. The spelling is now correct. We regret these errors.